In botany, orange refers to any of several types of small, evergreen trees or shrubs bearing round fruit and belonging to the genus Citrus, and in particular applies to the sweet orange (Citrus sinensis in many taxonomies) or the Seville, sour, or bitter orange (Citrus aurantium in many taxonomies). The term also refers to the edible fruit of this plant, which is orange, yellowish, or reddish when ripe and has a leathery, oily rind. Citrus is a genus of flowering plants in the family Rutaceae (orange family) and a common name for edible fruits of this genus. Other members of the genus include lemons, limes, citrons, grapefruit, pomelos (pummelo, pommelo), and mandarins (tangerines). Citrus fruits are a distinctive berry with the internal parts divided into segments. Many of the species are considered to be hybrids, and perhaps even the wild, true-breeding species are of hybrid origin. The orange is a hybrid of ancient cultivated origin, possibly between pomelo (Citrus maxima) and tangerine (Citrus reticulata). It is a small flowering tree growing to about 10 meters tall with glossy evergreen leaves, which are arranged alternately, of ovate shape with crenulate margins and 4–10 centimeters long. The white flowers tend to be very fragrant. Although originatng in Southeast Asia, the trees thrive around the world in warm-climate (tropical and sub-tropical) regions, including Brazil, Portugal, Mexico, India, Spain, North Africa, and the United States (Herbst 2001). While the orange fruit and flower serves the tree's individual purpose of reproduction, they also provide nourishment to animals, including pollinating insects, and aesthetic, sensual, and nutritional values for human beings. Orange blossoms have been used in weddings and the orange oil has been used in flavoring of food and drink and in adding fragrance to such products as perfume, wood conditioners, and cleaning agents. Not only is the taste of the orange fruit desired, whether the direct taste of sweet oranges or the use of sour oranges in making marmalade, but it is healthy, being rich in vitamin C and a good source of folate and fiber. The word "orange" ultimately comes from a transliteration of the Sanskrit naranga, which comes from the Tamil naru ("fragrant") (Herbst 2001). The fruit typically has 11 individual pieces inside and in Tamil, the word "Orangu" translates to "6 and 5" implying 11. In a number of languages, it is known as a "Chinese apple" (e.g. Dutch Sinaasappel, "China's apple". All citrus trees are of the single genus Citrus and hybridize very easily. That is, there is only one "superspecies" which includes lemons, limes , grapefruit, pomelos, tangerines, and oranges. Fruits of all members of the genus Citrus are considered berries because they have many seeds, are fleshy and soft, and derive from a single ovary. The distinctive fruit is a hesperidium in that it is a specialized berry with the internal fleshy parts divided into segments (typically 10 to 16) and surrounded by a separable rind (Katz and Weaver 2003). The citrus herperidium is globose to elongated, 4 to 30 centimeters long, and 4 to 20 centimeters in diameter. The rind is leathery and the segments, or "liths," are filled with pulp vesicles. The orange fruit is round; an orange seed is called a pip. Citrus plants are small trees or large shrubs, reaching 5 to 15 meters tall, with spiny shoots and alternately arranged evergreen leaves with an entire margin. The flowers are solitary or in small corymbs (a branched cluster of flowers with lower flowers having longer stems). Each flower is 2 to 4 centimeters in diameter, with five (rarely four) white petals and numerous stamens; they are often very strongly scented. 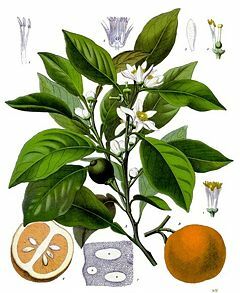 Nevertheless, names have been given to the various members of the citrus family, with oranges often being referred to as Citrus sinensis and Citrus aurantium, although the sweet orange is also referred to as Citrus × sinensis and the bitter or sour orange as Citrus × aurantium. The "Mandarin orange" or mandarin is a small citrus tree (Citrus reticulata) with fruit resembling the orange. However, the fruit is oblate, rather than spherical, and roughly resembles a pumpkin in shape. Specifically reddish orange mandarin cultivars can be marketed as tangerines, but this is not a botanical classification. It is sometimes listed as a third basic type of orange, grouped as "loose-skinned oranges" because their skins easily slip off the fruit (Herbst 2001). Their segments also are loose and easily separate. Oranges are considered to have originated in either India, Vietnam, or southern China. Citrus is likely the most widely planted fruit for direct human consumption in the world (Katz and Weaver 2003). The Persian orange, grown widely in southern Europe after its introduction to Italy in the eleventh century, was bitter. Sweet oranges brought to Europe in the fifteenth century from India by Portuguese traders quickly displaced the bitter and are now the most common variety of orange cultivated. The sweet orange will grow to different sizes and colors according to local conditions, most commonly with ten carpels, or segments, inside. Portuguese, Spanish, Arab, and Dutch sailors planted citrus trees along trade routes to prevent scurvy. On his second voyage in 1493, Christopher Columbus brought the seeds of oranges, lemons, and citrons to Haiti and the Caribbean. They were introduced in Florida (along with lemons) in 1513 by Spanish explorer Juan Ponce de Leon, and were introduced to Hawaii in 1792. A single mutation in 1820 in an orchard of sweet oranges planted at a monastery in Brazil yielded the navel orange, also known as the Washington, Riverside, or Bahie navel. The mutation causes navel oranges to develop a second orange at the base of the original fruit, opposite the stem. 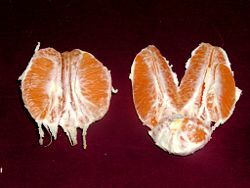 The second orange develops as a conjoined twin in a set of smaller segments embedded within the peel of the larger orange. From the outside, the smaller, undeveloped twin left a formation at the bottom of the fruit, looking similar to the human navel. Because the mutation left the fruit seedless and therefore sterile, the only means available to cultivate more of this new variety is to graft cuttings onto other varieties of citrus tree. Two such cuttings of the original tree were transplanted (Pitsenberger 2005) to Riverside, California in 1870, which eventually led to worldwide popularity. Today, navel oranges continue to be produced via cutting and grafting. This does not allow for the usual selective breeding methodologies, and so not only do the navel oranges of today have exactly the same genetic makeup as the original tree, but also, they all can even be considered to be the fruit of that single, now centuries-old tree. The Valencia or Murcia orange is one of the sweet oranges used for juice extraction. 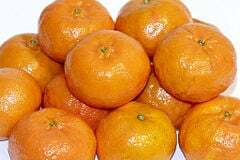 It is a late-season fruit, and therefore a popular variety when the navel oranges are out of season. For this reason, the orange was chosen to be the official mascot of the 1982 FIFA World Cup, which was held in Spain. The blood orange has streaks of red in the fruit, and the juice is often a dark burgundy color. The fruit has found a niche as an interesting ingredient variation on traditional Seville marmalade, with its striking red streaks and distinct flavor. The scarlet navel is a variety with the same diploid mutation as the navel orange. Citrus aurantium subsp. amara is a spiny evergreen tree native to southern Vietnam, but widely cultivated. It is used as grafting stock for citrus trees, in marmalade, and in the liqueurs Triple sec, Grand Marnier, and Curaçao. It is also cultivated for the essential oil expressed from the fruit, and for neroli oil and orange flower water, which are distilled from the flowers. Seville orange (or bigarade) is a widely-known, extremely tart orange now grown throughout the Mediterranean region. It has a thick, dimpled skin and is prized for making marmalade, being higher in pectin than the sweet orange, and therefore giving a better set and a higher yield. It is also used in compotes and for orange-flavored liqueurs. Bergamot orange, C. aurantium subsp. bergamia is cultivated in Italy for the production of bergamot oil, a component of many brands of perfume and tea. Chinotto is small bitter citrus fruit from the chinotto, or "myrtle-leaved orange" tree, Citrus aurantium var. myrtifolia. The tree grows to a height of 3 meters and can be found in Liguria, Tuscany, Sicily and Calabria regions of Italy. The chinotto is an essential flavor component of most Italian bitter amari digestifs, and of the popular Campari liqueur. A soft drink by the same name (chinotto) is produced from the juice from the chinotto fruit and herb extracts. Its appearance is similar to that of Coca-Cola. One of its unique attributes is that it tastes bitter and sweet at the same time. It is most commonly consumed before meals because it opens the palate to allow more thorough enjoyment of food during a meal. Daidai, C. aurantium var. daidai, is used in Chinese medicine and Japanese New Year celebrations. Oranges are a rich source of vitamin C. However, once cut or squeezed, the vitamin C quickly begins to dissipate, and after only eight hours at room temperature or 24 hours in a refrigerator, there is a 20 percent loss of vitamin C (Herbst 2001). In canned, bottled, or frozen-concentrate form the vitamin C content is greatly decreased (Herbst 2001). Oranges are a good source of folate, a source of vitamin A and B1, and fiber (Bender and Bender 2005). Oranges are widely grown in warm climates worldwide, and the flavors of oranges vary from sweet to sour. The fruit is commonly peeled and eaten fresh, or squeezed for its juice. It has a thick bitter rind that is usually discarded, but can be processed into animal feed by removing water, using pressure and heat. It is also used in certain recipes as flavoring or a garnish. The outer-most layer of the rind is grated or thinly veneered with a tool called a zester to produce orange zest, popular in cooking because it has a flavor similar to the fleshy inner part of the orange. The white part of the rind, called the pericarp or albedo and including the pith, is a source of pectin and has nearly the same amount of vitamin C as the flesh. Orange juice. Orange juice is one of the commodities traded on the New York Board of Trade. 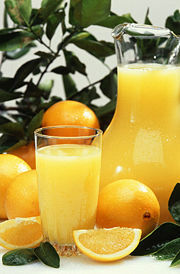 Brazil is the largest producer of orange juice in the world, followed by the United States. It is made by squeezing the fruit on a special instrument called a "juicer" or a "squeezer." Orange oil. Essential oil is a by-product of the juice industry produced by pressing the peel. It is used as a flavoring of food and drink and for its fragrance in perfume and aromatherapy. Orange oil consists of about 90 percent d-Limonene, a solvent used in various household chemicals, such as to condition wooden furniture, and along with other citrus oils in grease removal and as a hand-cleansing agent. It is an efficient cleaning agent, which is environmentally friendly, and much less toxic than petroleum distillates. It also smells more pleasant than other cleaning agents. Orange blossoms. The orange blossom is traditionally associated with good fortune, and was popular in bridal bouquets and head wreaths for weddings for some time. The petals of orange blossom can also be made into a delicately citrus-scented version of rosewater. Orange blossom water is a common part of Middle Eastern cuisine. 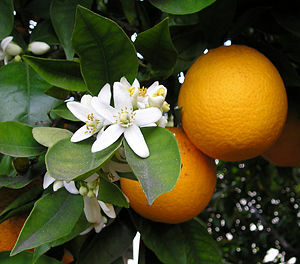 The orange blossom gives its touristic nickname to the Costa del Azahar ("Orange-blossom coast"), the Valencia seaboard. Tea. In Spain, fallen blossoms are dried and then used to make tea. Orange blossom honey. Orange blossom honey, or actually citrus honey, is produced by putting beehives in the citrus groves during bloom; where the bee [pollination|pollinates]] seeded citrus varieties. Orange blossom honey is highly prized, and tastes much like orange. Marmalade. Marmalade is a conserve usually made with bitter or sour oranges, which are too sour and astringent to eat raw. All parts of the orange are used to make marmalade: the pith and pips are separated, and typically placed in a muslin bag where they are boiled in the juice (and sliced peel) to extract their pectin, aiding the setting process. Orange peel. Orange peel is used by gardeners as a slug repellent. Narthangai. The unripe fruit called "narthangai" is commonly used in Southern Indian food, especially in Tamil cuisine. The unripe fruit is pickled by cutting it into spirals and stuffing it with salt. The pickle is usually consumed with thayir sadam (curd rice). Oranges are picked when fully ripe, since they do not further ripen after picked. Since oranges are susceptible to frost damage, growers commonly use sprinklers to coat them with ice when temperatures go below freezing. This practice protects the crops by regulating temperature. Picture of a Cara Cara orange (left) with a pink grapefruit for comparison of size and color. While still maintaining an orange peel, the blood orange has streaks of red in the fruit and a dark burgundy pulp. Aerial view of an orange grove. McPhee, John A. 1991. Oranges. New York: Noonday Press. Pitsenberger, T. 2005. Parent Washington navel orange tree. The Blogging Nurseryman. Retrieved July 28, 2007. This page was last modified on 2 April 2008, at 13:34.